At Sarah Darkmagic’s suggestion, I picked up some card protectors for my players… green for at-will powers, black for daily powers, red for encounter powers, and gold for item cards. Very cool. These work great and make the cut-out, paper powers printed from the Character Builder feel more substantial… it’s a meaningful upgrade, sort of like the difference between cheap plastic poker chips and the weight of a nice clay piece. At about the same time, I was prepping to give my party their first magic items – some consumable, plus a little armor, etc.. 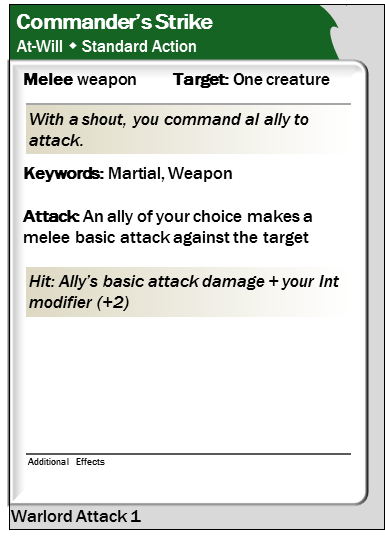 While I think you can print out cards for the published items right from the CB, I wanted an easy way to make custom cards (most of the magic items in my campaign will likely be somewhat custom to enhance their place in the story). This template is the result. The styling is based closely on one of the CB power cards… enjoy.